They will head home to their cottage in the grounds of Kensington Palace before attending their first official royal engagement as the Duke and Duchess of Sussex -- the 70th birthday patronage celebration for Prince Charles. The outdoor event marks the heir to the throne's milestone birthday - which falls in November - by recognizing Charles' patronages and military affiliations as well as others involved in charities supported by the royal. Harry sourced the diamond in Meghan's engagement ring from Botswana, the world's biggest producer. "Kisstory" said the Sunday on Sunday newspaper. "Harry and Meg's historic change for monarch." "There is power in love," said the Sunday Times, referencing a passionate sermon by U.S. Episcopalian Bishop Michael Bruce Curry. 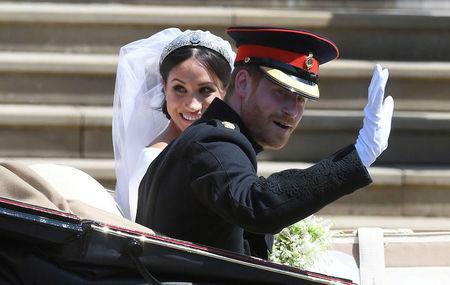 Some media reported that Prince Charles had wedding guests rolling with laughter with his speech after cracking a joke about changing Harry's nappy.